Hawkfest is a unique event staged by Hawkwind. The festival came about after the systematic dismantling of the free festival movement in the mid to late 80's. Hawkwind were regular visitors to Stonehenge and many of the smaller events that took place each summer. Upon being invited to Glastonbury and playing at many of the larger commercial festivals in the late 90s, early 2000s, they felt a certain sadness at the way in which the festival scene had developed. Gone was the intimate, carnivalesk, atmosphere, filled with colourful characters. This was replaced with commercialism on a huge scale, the coldness of being alone in a large city, with the lurking danger of being attacked or robbed. 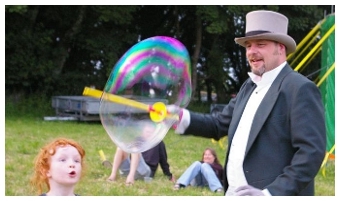 They longed for a return to that original vibe and feel, a genuinely family friendly festival where children could play and explore whilst parents were safe in the knowledge that it was a safe and secure environment. This would be achieved by making it a private party rather than a full blown commercial event and by limiting the numbers to around 1500 plus crew, bands and performers. All tickets are sold in advance and attendees must be the holder of a Hawkwind Passport, (free to obtain and proudly held by over 7000 fans worldwide). However organising these events is no easy task and with the band still touring regularly, releasing albums and generally being a living breathing entity it was decided to take a break for a couple of years so that batteries could be re-charged so when the festival did return it would come back re-invigorated, bigger and better than before. And return it did in 2007 when Hawkfest came back for its third incarnation on a site near the legendary Donington race track in the east midlands. Another stunning array of over 40 bands was lined up, this time a more diverse mixture, leaning towards a world music event. French metal band Prime Sinister, Bob Kerr’s Whoopee Band (ex Bonzo Dog Dooda Band), Ken Colyers Jazz Band, chart topping dance act Utah Saints played amongst reggae, ska, folk, country, punk and space rock acts. However the undoubted highlight of the whole weekend was the wedding of Dave Brock and Kris, an event that all Hawkfest attendees were invited to and once more bore out the family friendly nature of the event. A large, festival site shaped wedding cake was distributed to the fans, along with over 1000 glasses of “champagne”. Another first at Hawkfest 2007 was Hawkwind Question Time, using the format of the popular TV show of the same name, but hosted by TV presenter Matthew Wright, this has become a regular favourite at subsequent Hawkfests. 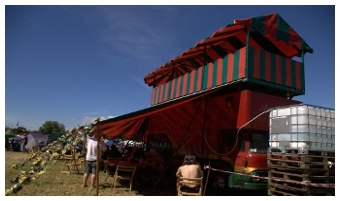 Moving to a Greenfield site in 2008 allowed the band and organisers more freedom and it was decided to totally abandon having a fenced, private backstage area, in favour of a more relaxed and open atmosphere. Now all the bands camp, eat and drink with the fans, raising the Hawkfest experience onto another level. At Hawkfest there are as few rules as possible, the theory being that if there are no unnecessary rules or boundaries, then folk will not try to break them. Band and festival goers alike, regard themselves as part of the “extended Hawkwind Family” and they all look out for each other. So far, Hawkfest has a zero crime rate, with lost cash and belongings being regularly handed in to reception. 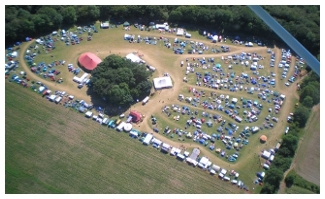 In 2008 Hawkfest moved to a stunning hilltop site in Devon with more great bands appearing. This year fans were treated to guitar workshops by Dave Brock and Huw Lloyd Langton, drum workshops by Hawkwind drummer Richard Chadwick and dance workshops by stunning Hawkwind dancers Laura and Matt. Hawkfest 2010 is planned to be very special indeed. Returning to Afton Down on the Isle of Wight, the site of the iconic 1970 Isle of Wight festival, where 40 years ago to the day, 27-29th August, Hawkwind played outside the fence, in protest at the over commercialism of the event. 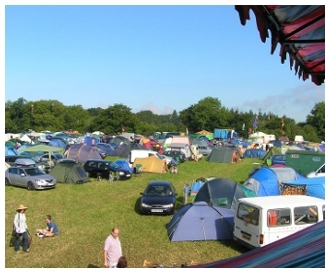 Both the current Isle Of Wight Festival and Bestival are held at different locations on the island. This will be the first live music event to take place at the Afton site since 1970.